Tired of his erratic hours working as a chef, Hector Espinoza went to the DMV picturing a job as an over the road truck driver. But when he ran into a friend there to get a license to become a bus operator, his outlook changed. A decade later, Espinoza has earned a reputation as a skilled and well-liked bus operator with experience at a number of local transit providers. He’s spent the last five years working full-time at Metro Transit. The transformation has indeed been a good one for Espinoza, who works out of Metro Transit’s South Garage in Bloomington. Working as a bus operator has provided him a better work-life balance that allows more time with his wife, three sons and a daughter, superior pay and benefits and an optimistic outlook on his career. He’s also developed a passion for working with the public, deliberately choosing busy urban routes where there are ample opportunities to interact. Espinoza is sharing his experience as Metro Transit works to recruit more operators needed to support the agency’s growth and respond to a wave of retirements. He recently visited a south Minneapolis church where he spoke in front of the congregation about career opportunities. A native of Ecuador who speaks Spanish, he’s particularly interested in letting Latinos know about what it means to work at Metro Transit. 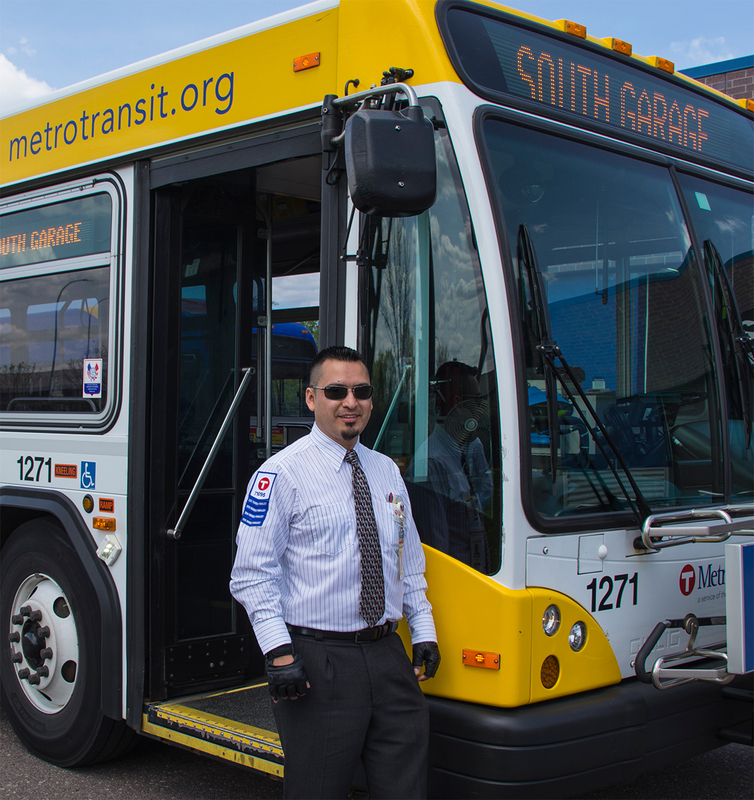 Many of Metro Transit’s managers and supervisors began their careers as operators; Espinoza hopes to follow a similar path. For now, though, he’s focused on being the best operator he can be. And he’s doing a good job of it, too. Espinoza has three years of safe driving and has placed in the top ten in each of Metro Transit’s annual Bus Roadeo competitions. Bus Roadeo tests operator’s skills through a series of driving and written tests. Espinoza also takes pride in keeping a neat appearance, wearing a tie whenever he’s working (his co-workers have noticed, giving him the nickname “Hollywood”). Routes: Espinoza primarily drives urban local routes, including the 5, 4 and 6. Hobbies: Espinoza is active in his community, Apple Valley, and serves as a community soccer coach. He also enjoys playing volleyball and soccer and cooking. To help you better get to know those getting you around, Metro Transit offers these 'Know Your Operator' profiles of train and bus operators. To suggest an operator for a future profile, please email ridersalmanac@metrotransit.org.